Darren McCauley says he and his Coleraine team-mates are determined to secure European football for the club and the town. 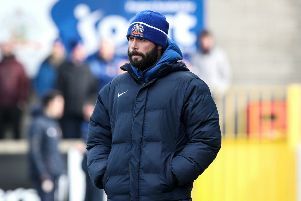 The Bannsiders are on the brink of qualifying for next season’s Europa League - they are six points ahead of Cliftonville with three games left to play. Coleraine travel to Crusaders tonight (Tuesday) knowing a positive result will all but secure qualification. “It will be another tough battle against Crusaders, it’s never easy playing them,” said McCauley. McCauley came off the bench to score his third goal in three games on Saturday. And if he plays at Seaview it will be his 100th appearance for the club. “I’m very proud to be on the brink of 100 games for the club, I never thought I would get to that milestone,” he said. Meanwhile, Coleraine has been gripped by Irish Cup final fever. Fans have erected flags around the town and local businesses are also showing their support. The club are offering the winners of their window design competition TWO tickets to the final on May 6th!